What has meaning in our lives? Why do we make the decisions we do? How do we choose our friends, our lovers, our jobs? When we lie to ourselves, how do we get at our authentic “truth”? 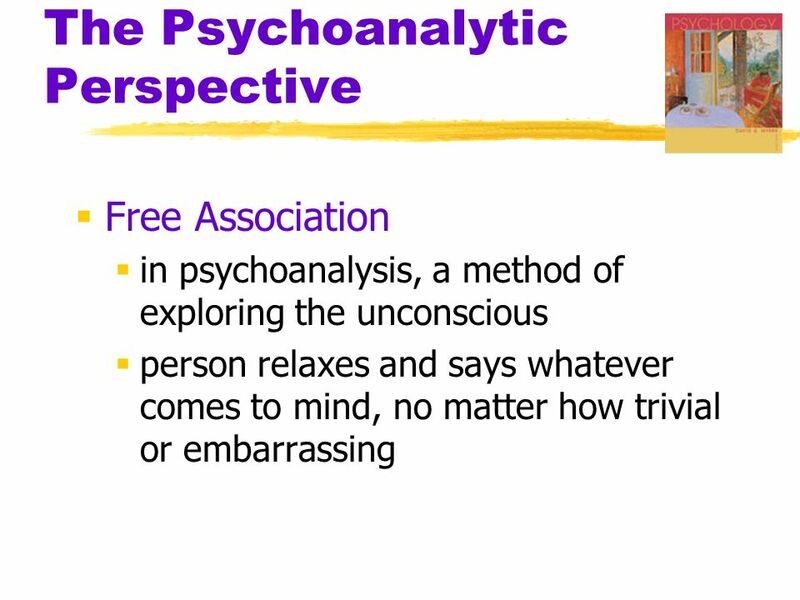 The answer, according to psychoanalysts, is straight-forward: Free Associate! This means exercising the mind in an unrestrained way to determine what pops in and out at any given moment. For example, sitting in traffic, it is curious what thoughts arise to consciousness? Frustration, anger, acceptance, or imaginative thinking? Thinking about thinking takes time, and effort, and in the presence of a therapist, can present issues of shame and guilt. Sexual thoughts, greedy thoughts, competitive thoughts, can all bring a sense of unworthiness to the relationship, and as such, those thoughts can be suppressed leading to feelings of conscious anxiety without known antecedents. The hallmark of psychoanalytic work is allowing time, and openness to see what the patient brings to the relationship, which is in stark contrast to the “T” therapies (such as CBT, DBT, IPT) in which the therapist has an agenda. The lack of an agenda is KEY to understanding the meaning that patients’ assign to the experiences in their lives. The other KEY is time and patience. For patients to free associate, they must speak without fear of judgment, and this can only happen in the context of a trusting and reliable relationship. This “frame” as you will, provides an opportunity for patients to feel safe to “free associate” since free associating is a scary activity. Being afraid of one’s own brain is the hallmark of anxiety disorders, and as such, to make friends with one’s thoughts is a journey of self-discovery and self-acceptance. The length of this journey is not knowable from the outset, and hence restrictions on the number of psychotherapy visits is simply absurd. Thought suppression, the hallmark of Cognitive Behavioral Therapy (CBT) is antithetical to thought acceptance in that thought suppression might provide temporary relief, in the longer term, buried thoughts resurface in ways that can be more disturbing and more unpredictable, whereas free association offers the promise of a more sustaining treatment in that the technique helps the patient cope with whatever uncomfortable thoughts come to mind. The point here is not to say that CBT is bad for everyone but rather to say that it is not good for everyone, and should not be a one size fits all approach to anxiety disorders and/or depression. Psychopharmacology is another intervention for anxiety/depression, and as such, medication can facilitate free association in that the patient may feel more relaxed in order to allow his brain to connect seemingly unrelated ideas. Hence medication can be a tool which eases the psychotherapeutic process, a benefit of medication which is usually not touted. In summary, it is the loss of free association in psychotherapy which saddens me. The restriction of thought takes away both a deeper relief in patients and a deeper sense of work satisfaction in the provider. Superficial treatments bring superficial results and thereby superficial feelings of job satisfaction. Deeper treatments bring the opposite. We have deeper treatments to offer patients, but as I have said many times, as a field, we have lost our way and forgotten about that. Presented by Shirah Vollmer, M.D. private practice in West Los Angeles. In preparation for my upcoming class I am reading Victor Frankl’s book, Man’s Search for Meaning. as well as learning about cognitive semiotics. Semiotics is the study of meaning-making, the study of sign processes and meaningful communication. Plus, I am learning about Ikigai, the Japanese concept meaning “a reason for being”, which is similar to the French phrase Raison d’etre. The word ikigai is used to indicate the source of value in one’s life or the things that make one’s life worthwhile. These concepts arise in the consultation room where patients search to articulate distress. How does one talk about not having meaning in their lives? One common pathway is through psychosomatic illness. The patient feels convinced that there is something terribly wrong with them, but the doctors have not discovered it yet. Indeed, sometimes that is true, but it can also be true that the patient feels psychologically empty, and through a belief system that their body has betrayed them, they can focus their psychological distress on the search for a diagnosis. Psychopharmacology springs to mind, as many patients believe that antidepressants will give their life meaning, and indeed, this belief system, along with a relationship with the prescribing physician, can jump-start the patient to re-engage with life in new and exciting ways. Is this the placebo effect? Indeed, placebos give patients a sense of a before and after experience. “Now that I am taking this drug, now that I am doing this diet, now that I am meditating,” fill in the blank, patients have an opportunity to feel a new beginning, which sometimes gives the patient permission to feel excited and renewed. In other words, the patient imbues meaning into the new activity which gives them a sense of excitement and vitality. Meaning often comes from relationships, new or old, in which the patient seeks to feel a closeness and in so doing pursues activities that he/she feels the other person would also find meaningful. Patients, for example, suddenly feel they are going to change careers and become psychotherapists. In part, this may be a good career choice, but at the same time, it may be a way for the patient to feel closer to his therapist. These partly conscious, partly unconscious decisions are derived from a search for value and depth which goes beyond Freud’s dictum that what man seeks most is pleasure. So, you wanna take my class? I would love to have you. 1. I am overwhelmingly sad by what I see as the death of my profession, and the transformation of psychiatry into a specialty that has more similarities to Neurology than it does to Psychology. 2. As a result of number 1, I see patient care being compromised significantly, and as such, many vulnerable people are being mis-labeled and “educated” to see themselves as ill, as opposed to experiencing human suffering. 3. Also as a result of number 1, those attracted to the field of psychiatry are not necessarily interested in the human mind and the various nuances and uncertainties which flow from this immensely fascinating organ. 4. Although I have a passion for psychoanalysis, I am also concerned that psychoanalysts are trying to “justify” their position by developing outcome measures, when in fact, human beings, at least in terms of their mental state, are not measurable. I think we have to come to accept that if insurance companies what outcome measures for our work, then we cannot accept insurance. 5. Further from number 1 are patient expectations that human suffering can be significantly alleviated with a medication, which although sometimes that is true, for the vast majority of people, it is not true. 6. Psychiatrists, by my way of thinking, jumped on the ship of “medication management” and in so doing, committed professional suicide for all of us. The result is less job satisfaction, less patient satisfaction, and poor patient care. 7. The “is bad care better than no care question” plagues all of health care, and in particular mental health care. I blog to struggle with those issues. 8. I blog to focus my teaching, to learn to make my points concisely and directly. 9. I blog to think clearly about hypothetical, or fictionalized patient scenarios. It is a “consultation,” if you will. 10. I blog to describe the thoughtfulness that goes into listening; to review the lost art.